The People’s Bank of China (PBOC) reported that financial institutions issued $865 billion in new loans in the first quarter, beating last year’s $750 billion. Last month, banks approved $251 billion in loans, the second highest monthly total since March 2009. This is part of Beijing’s overall strategy to stimulate the economy: heightened bank credit lending, financial support from local governments, and special purpose bond issuances. Certain sectors of the economy are witnessing a resurgence in the first three months of 2019. One such area is construction. According to the China Construction Machinery Association (CCMA), sales of excavation equipment surged by more than 60% in the first two months of 2019, leaving many analysts to believe that the stimulus is beginning to have positive effects. CCMA data found that the country’s 25 leading excavator manufacturers sold 44.78 units in March, a 15.7% jump from March 2018. Investors pay close attention to excavator sales because this machinery is widely used in infrastructure, construction, and real estate projects. This comes as China imported 391,000 tonnes of copper last month, up 25.7% from the previous month. The industrial metal is an important component for infrastructure and real estate development. China is the world’s largest consumer of the red metal. Could this mean a turnaround in the first quarter? The PBOC says the economy has shown plenty of positive changes, and that it will maintain its monetary policies to provide liquidity to the banks, boost fiscal policy to encourage growth, and ensure other policies are stabilizing the yuan. The USD/CNY currency pair rose 0.07% to 6.7087, from an opening of 6.7042, at 18:02 GMT on Monday. 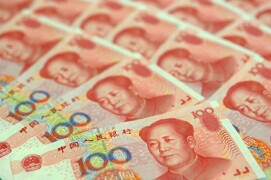 The EUR/CNY surged 0.15%, to 7.5832, from an opening of 7.5721.